Since the beginning of the year, my mom has been off of sugar. She has much more self control than I do. Maybe if I didn’t have to be off of gluten, eggs, and dairy I could do it, but 3 major food avoidances is all I can handle. The only treats she has had are clementines, a piece of toast with jam, or some date balls I had made. I wanted to see about making her a real treat. I had seen a plethora of posts about brownies or blondes made with beans, so thought I would give it a go. 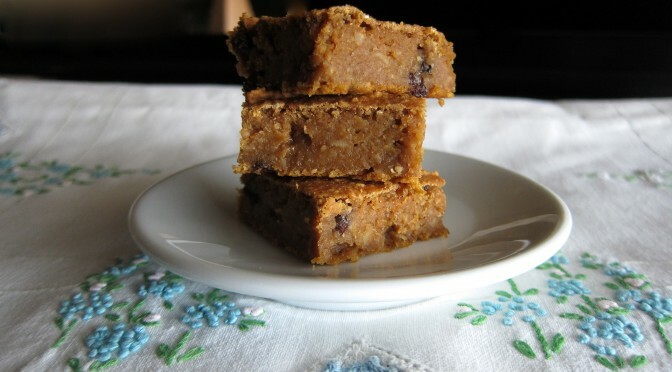 I tried a garbanzo bean blondie recipe once before, and I don’t know if it was all in my head, but all that I could taste were the beans. Consequently, I was hesitant to have another go at it, but I decided to try it again, this time using more spices to conceal the pungency of the garbanzos. So I knew I was going to use spices, and what better ingredient to go with spices than pumpkin? 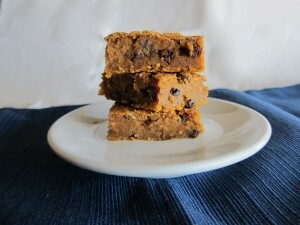 I looked at a half-dozen recipes for bean blondies. Many called for sugar, which I had to avoid for my mom’s sake. Many also called for oil and/or peanut butter, which I also wanted to see if I could avoid. To solve those problems, I substituted maple syrup for the sugar, and a little extra pumpkin for the fat. Like what I do with my pumpkin cupcakes, I cook the canned pumpkin and spices for a few minutes so they don’t taste like a can or jar. I also used currants instead of the typical raisins because they can be more evenly distributed in the batter. If sugar isn’t a concern then using Enjoy Life Mini Chocolate Chips would be a delicious choice. This recipe doubles well (as long as your food processor has the capacity, of course). I just use a full can of pumpkin when I double it. The blondies also freeze well. I cut them into square and put each square in a little snack bag. Great for a little guilt-free treat. In a small pot over medium heat, place canned pumpkin and pumpkin pie spice. Cook for 5-7 minutes until very fragrant, stirring occasionally. Place pumpkin mixture, and remaining ingredients (except currants) in a food processor and blend for about a minute. Stir in currants. Place in a greased 8x8 baking dish and bake in preheated oven for 30-35 minutes. They should pull away from the sides of the pan. Place pan on cooling rack to cool. These were a hit not only with my mom, but also with my dad. I didn’t tell either of them at first that there were beans in it, and when I revealed the ingredients, they were shocked, but they still went in for seconds (and in my dad’s case, thirds and fourths). 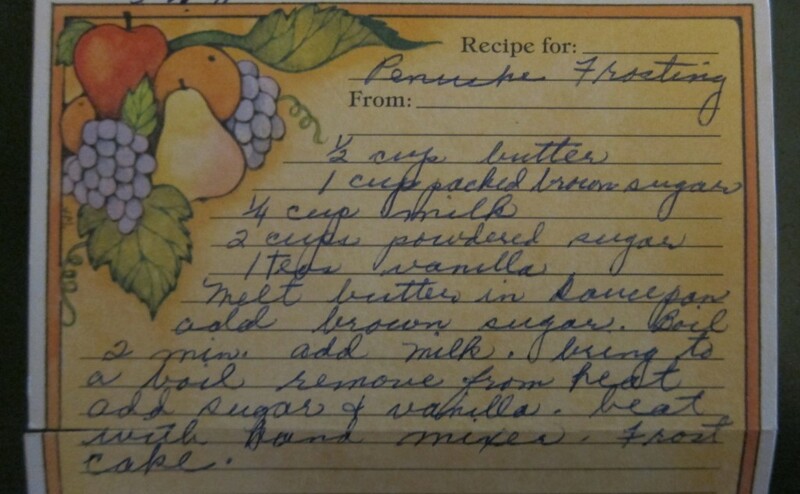 I was going through my grandma’s old recipes the other day, and it brought back quite a few memories. I remember the many holidays spent at her house as well as the time spent making brownies at cousin sleepovers at her house. I also remember stopping by her house after school while on the way to piano lessons, and she would have a new dessert every time. It was awesome. She had quite a few recipes in her arsenal, but she also enjoyed trying new things. She was an avid recipe clipper, and one of the funniest (and weirdest) recipes I came across in her recipe box was for an earthworm cake. And I’m not talking gummi worms people (don’t worry, that’s one recipe you won’t see here). 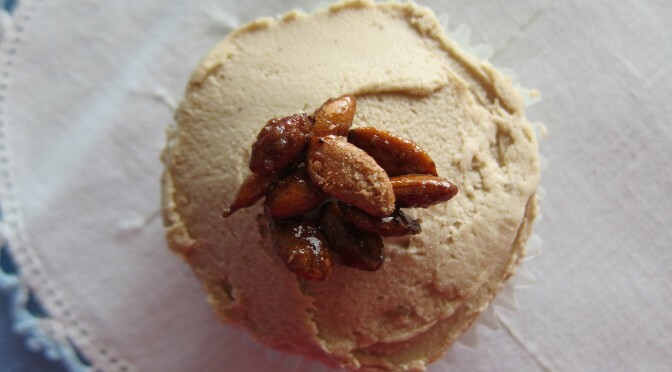 This recipe for penuche frosting doesn’t really fall into either category. It wasn’t one that I remember her making, and it wasn’t a clipping, but I really wanted to try it. I had never tried the penuche frosting before. I’ve always been intrigued by in, in part because I was never sure how to pronounce it. I’ve had penuche fudge before. One bite and I got a sugar headache. Nevertheless, I wanted to try this frosting recipe of my grandma’s (and make it dairy-free of course). It turned out perfect. It still was pretty sweet, but also offered a more complex flavor than typical frostings. Now I needed a cupcake to go with it. Pumpkin or spice cake seemed like the logical choice. The molasses that is a component of the brown sugar in the frosting would work perfectly with the flavor. The thing with pumpkin cake is that they often seem to taste like a can. This is remedied by cooking the pumpkin puree and spices for a few minutes. Preheat oven to 350. Spray muffin tin. In a medium bowl, whisk together brown rice flour, sorghum flour, potato starch, tapioca starch, anthem gum, baking powder, and baking soda. Set aside. In a medium saucepan, mix together pumpkin, cinnamon, nutmeg, ginger, cloves, and salt. Cook over medium heat, stirring constantly, for 5-7 minutes until very fragrant, and darker. Mixture should be slightly reduced. Remove from heat and mix in brown sugar, white sugar, coconut milk (mixed with lemon juice), water, coconut oil, and vanilla extract. Whisk this into dry ingredients until combined. Fill muffin tins 3/4 of the way full with batter. Cook in preheated oven for 18-20 minutes or until toothpick inserted into center comes out with a few moist crumbs (these cupcakes are very moist so there will be moist crumbs are okay). In saucepan, melt coconut oil over medium heat. Add brown sugar and cinnamon. Boil for 2 minutes, stirring constantly. Carefully add milk (it will boil pretty vigorously). Remove from heat let cool until lukewarm. Using an electric mixer, beat in vanilla extract and powdered sugar. As the frosting cools from the mixing and air is incorporated, it will lighten in color (I've sped up the process before by putting pot over a bowl of ice). Preheat oven to 325. Line a sheet pan with parchment or a silicon mat. In a bowl, mix sugar, vanilla, salt, and water. Stir in pumpkin seeds. Spread evenly over pan. Cook for 10 minutes. Stir seeds. Cook another 5-10 minutes, until seeds are browned. Frost cupcakes with a small amount of frosting (it is a sweet and flavorful frosting so you really don't want to put frosting on more than 1/4" thick). Top with candied pumpkin seeds. 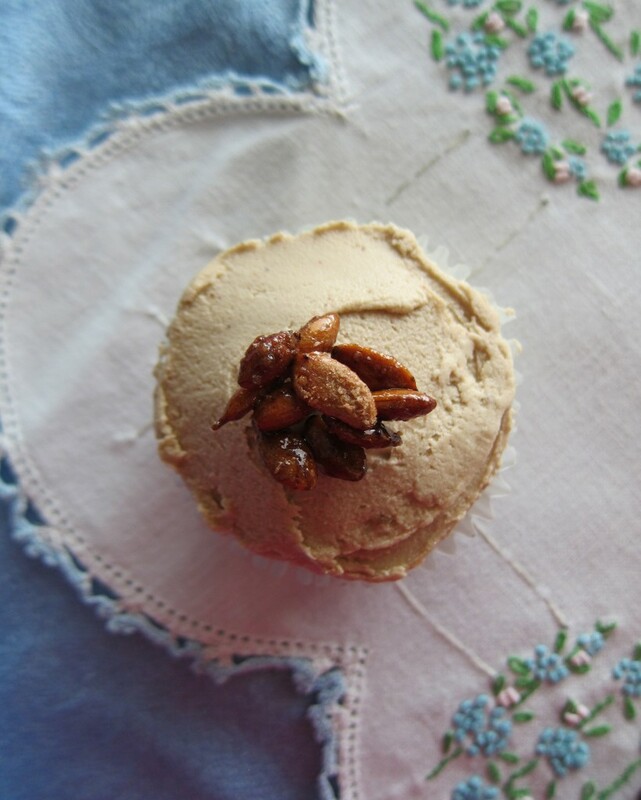 The pumpkin seeds are purely optional, but I love to have a little crunch with these cupcakes. And, hey, pumpkin seeds are high in omega-3 so it makes the cupcake healthy. Right?